It’s time to finally get to the Jungle Book review. This film got a lot of recognition for its superb CGI and how realistic the animals ended up looking. They definitely do look pretty sharp and I’ll give the film a lot of kudos for its effects. Despite being a film with a lot of animals around and having a kid as the main character, Jungle Book did pretty well for itself. Honestly, the film would have been even better if Mowgli was older, but that’s for the sequel. Mowgli is a kid who was raised in the forest. As such, he is used to being around animals instead of humans. Unfortunately, Shere Khan doesn’t approve of this. He faced a human once and lost his eye so now he thinks that all humans are evil. Honestly, most of the humans probably would come to the forest with the intent to do the animals harm, but Mowgli is too young for any of that. Mowgli is forced to go on the run when his clan is taken over by Shere Khan so now he must find some reinforcements and stop Khan before anyone gets hurt. He’ll need the help of a friendly bear, a panther, and a host of other animals who are around the bend. Mowgli is not a bad character, but I still think that kids can’t really hold their own films effectively. It’s just too hard to take him seriously. The scenes of him roaring, running around, or getting stung by bees all rank among the lower moments of the film. It’s really the side characters who do a good job of showing us why this film is good. Take Baloo for example. He’s the best character in the film and since he is a bear, the guy is also a threat to the villains. A Bear would probably lose to a Lion in real life if they fought….but it would be very close. Both of them can conceivably defeat the other. Shere Khan is a tiger so then this helps Baloo’s case, but this bear isn’t a fighter anyway so that minimizes the advantage. Baloo is all about making equal partnerships and he’s a reasonable fellow. He’s a great friend to have around and he added some nice humor to the film. If he was intended to be the fan favorite all along, then the film definitely did a good job of making him a likable character. Bagheera is the main Panther and the one who raised Mowgli ever since he was a kid. He’ll remind you of the main Panther from Animal Land and you can really draw a lot of similarities between this and that series. That one is a lot more extreme with the violence though and I don’t actually recommend it. It also got pretty supernatural by the end with all of the Chimeras running around and being as strong as Kaiju. That was certainly crazy. Bagheera may not be the absolute strongest animal here, but he’s a good all around fighter. I’d say that he seems to be a little stronger than the wolves, but not quite as powerful as the tigers. Bagheera is definitely one of the more likable characters in the film and while he may not be great at working with others, he learns to be a team player in the end. Shere Khan is a great villain and he certainly makes his presence felt. I do think it was a little iffy how easily he defeated the Wolves though. They had numbers on their side and the leader shouldn’t have allowed himself to be taken out so easily. It’s a classic example of why arrogance leads to a fall. The Wolf wanted to show that he was in control of the situation so he lay down and pretended to be at ease. This made Khan’s plan all the easier. Khan would have won anyway, but I like to think that a prolonged fight against the whole clan would have been far too difficult, even for him. Khan is definitely persistent and you have to give him credit for never giving up. He never went down without a fight. Kaa is another villain who got a big scene in the trailers, but didn’t actually do all that much in the film. She really got a glorified cameo if anything. Her illusion abilities are certainly handy, but in a fight she is clearly outmatched against the rest of the characters. The main character is one of the only people that she can defeat although to be fair, he’s the only one that she needs to eat in order to end the adventure. If the film has any weakness, it’s that it can drag a little bit at certain points. For example, the escapade over to the Baboons. The plot didn’t really add anything to the movie and I never really care for the monkeys. It was impressive just how large the King was and the chase scene was cool, but it just felt like filler. The heroes were also so vastly outnumbered that it was just hard to see how they escaped from that plight without more serious injuries. I didn’t want any more bee injuries though because that always looks pretty gross so Monkeys were preferable. I also would have loved it if the film had taken place in the city, but then it’d be a completely different film right? The writing was good, which always goes a long way in these movies. Bad writing would have made this film quite sad. I can’t say that I really recall there being much of a soundtrack in this film. That would have been pretty neat, but it wasn’t a bad soundtrack at any rate. I think there were some generic danger and action themes in there somewhere. As mentioned before, the graphics are pretty realistic. I prefer more fantasy esque graphics of course, but this wasn’t supposed to be that kind of movie anyway. As far as realistic animals go, Jungle Book did a really good job. Overall, The Jungle Book is a good film. You’ll definitely get some Lion King vibes from the main villain and the scene where he “befriends” the cubs as a threat to the Mom is certainly familiar. Shere Khan definitely made for an epic villain. This is the kind of film that can definitely stand on its own without a sequel, but a sequel certainly wouldn’t hurt. There is definitely a lot that they can do with this series, but there are also a lot of ways that it can jump the fence. The writers will have to be careful how they handle this. I’d recommend checking out the film. 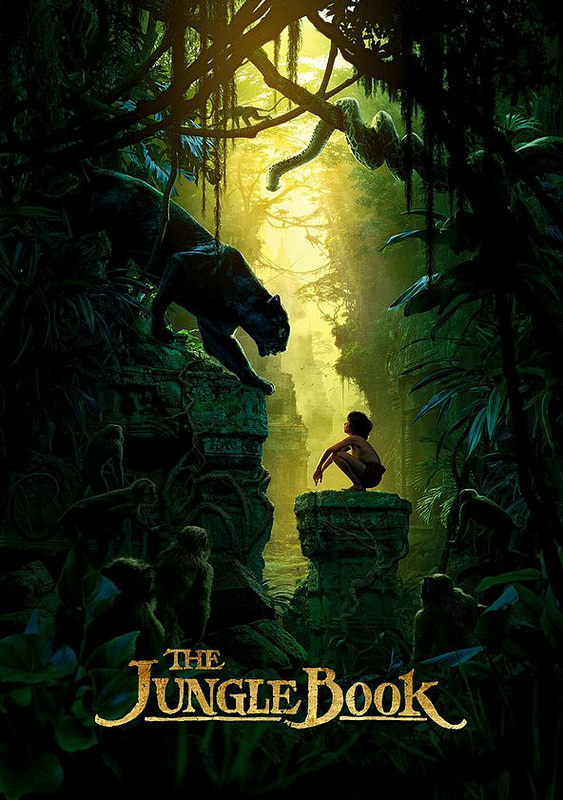 There may be some scenes that drag on and Mowgli isn’t all that good, but by and large this is a solid film. The positives clearly outweigh the negatives and that’s always the important part. I think this film would have easily gotten a 7 if the main character had just been a little older, but that’s how it goes sometimes. This entry was posted in Live Action Movie Reviews, Live Action Movies, Reviews and tagged 2016 Film, Animals, CGI, Disney, Live Action, Movie, Movie Review, Review, The Jungle Book, Thriller by dreager1. Bookmark the permalink. Did you feel like having big name actors voice the animals was a detriment to the film? That seemed to be a common complain, you hear the person and not the animal.